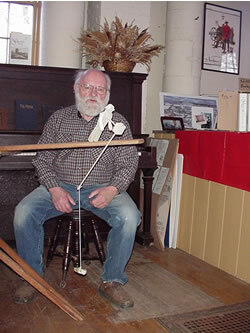 Saturday, May 21st will be a busy day at two of Gilford Village’s museum buildings. Starting at 9:30 a.m. and running through 3:00 p.m., the Rowe House, at 88 Belknap Mountain Road, will be the site of a “Plant and Bake Sale,” the proceeds of which will go towards refurbishing the gardens of that unique c.1838 Greek Revival Cape, which is on the NH State Register of Historic Places. Many gardeners have made an effort, as they have been subdividing their perennials this spring, to set aside some subdivisions to contribute to this Rowe House Gardens Fund Raiser. This generous sharing gives other gardeners an opportunity to add to their own gardens, plants that have already proved themselves hardy enough to survive the harsh winters which are customary in the Lakes Region. This sale day provides a chance for gardeners to talk among themselves, ask pertinent questions, and glean from the experiences of other local gardeners, some of whom are Master Gardeners. The vintage Rowe House touches the hearts of all who come to know it. Its south-facing entry way reveals its real essence, a well-preserved farmhouse reminiscent of the days when Gilford was truly a farm community with its hillsides and vales dotted with farms and farmhouses. Preserving and celebrating Gilford’s cultural history includes the work of volunteers who are now turning their attention to the Rowe House Gardens. – Even the children are involved, with students in Ms. Wendy Oellers’ third-grade class planning how best to create an herb garden near the doorways to the Rowe House kitchen. Meanwhile down the street at 8 Belknap Mountain Road, the Grange Museum Building will be the site of the Heritage Arts and Crafts Bees that are held there the third Saturday morning of each month from 10:00 a.m. until noon. Upstairs in Grange Hall, rug braiding and knitting will also be joined by ABC quilt making. During field trips to the Grange Museum Building, May 6-13, Gilford Elementary School’s third graders created illustrations on 100 muslin squares that will be featured in ten 40”x40” ABC quilts. Now volunteers are needed to sit at sewing machines to assemble the pieces to create the quilts – hopefully an activity that will be part of this Saturday morning’s bee. 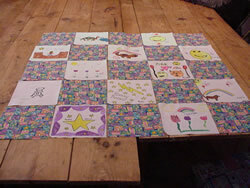 This is the fifth year that Thompson-Ames Historical Society’s volunteers, as part of annual field-trip activities, have provided an opportunity to Gilford’s third graders to be involved in the ABC quilt making endeavor, a community service project launched originally by Jan Dean and Sue Keene. 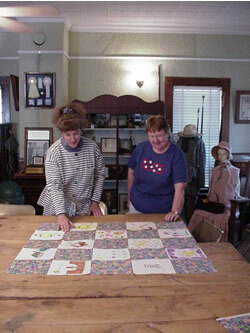 Each year the completed quilts are displayed at the Gilford Elementary School for everyone to see before school closes for Summer Vacation, at which time the quilts are then sent on to provide love and comfort to at-risk babies and young children. Carol Anderson, who helps shepherd the Heritage Bees in Grange Hall, welcomes persons of all ages to come to the monthly Saturday get-togethers to socialize and enjoy light refreshments while busying themselves in interests that appeal to them. Also, this Saturday morning downstairs in the Grange Museum Building, wooden toys of historic design will offer activities for persons of all ages. Stan Piper extends a welcome to all persons who are interested in working with wood – no previous skills are needed! “Will-o’-the-Wisp” proved a hit at the April get-together and was shared with third-graders during their recent field trip to the Grange Museum Building. In time for this Saturday, Gus Pinto and Stan have worked together to produce “Man on the Edge,” a wooden toy of historic design that exhibits an amazing balancing act while precariously teetering back and forth. Kits for both items will be available Saturday morning as will be wood workers willing to patiently guide interested participants in assembling either of these wooden toys of historic design. Do mark your calendar for Saturday, May 21st and come to Gilford Village to participate in history revived. phone 527-9009 and leave your name, telephone number and a short message; you will receive a return call.